Keep in mind that military ID or proof of service is normally required. An array of fast food chains, restaurants and breweries are showing their support for America's troops with deals and freebies on Veteran's Day. Veterans Day falls on Nov. 11, which is a Sunday this year, so federal offices will observe the day on Nov. 12. So, some businesses have chosen to have deals on either Sunday or Monday — a few will have offerings on both. Applebee's: The restaurant chain is aiming to serve one million meals to veterans and active duty military on Nov. 11. Choose a free full-size entrée from one of their eight "fan favorites." Acapulco: All military personnel, past and present, can grab a free complimentary 3-item combo on Nov. 11. Choices include: tacos, enchiladas, taquitos, tamles and chile relleno. Buffalo Wild Wings: Participating locations are offering one small order of traditional or boneless wings and side of fries to active and retired armed services members. Dine-in only, and proof of military service is required. Biggby Coffee: On Nov. 11 and Nov. 12, active and retired military members can pick up a free 16, 20 or 24-ounce brewed coffee. Bar Louie: Veterans and active military can get a free meal, which includes a free burger of flatbread up to a $15 value from open to close on Nov. 11 — Military ID is required. Through Nov. 12, guests can also donate to Operation Homefront' Critical Financial Assistance program to benefit veterans and their families via an add-on to their check. Bob Evans: Veterans and active duty military can get a free meal on Nov. 11. Choose from one of these six "favorites." Bonefish Grill: Active and retired service members with valid military ID can get a free appetizer, like Mussels Josephine, Calamari, Imperial Dip or Bang Bang Shrimp on Nov. 11. BJ's Restaurant & Brewhouse: Active and retired military can get a free entrée, up to a $12.95 value, plus a free Dr. Pepper on Nov. 11, dine-in only. Throughout November, current and former military can also get a free Pizookie dessert, purchased by guests that opt to contribute an extra $1 for the "But a Hero a Pizookie" program. California Pizza Kitchen: At participating locations, veterans and active duty military can get a complimentary entrée from CPK's special Veterans Day menu, plus a buy-one-get one gift card for pizza, pasta or salad (redeemable Nov. 12 to 18, while supplies last). Chili's: On Nov. 11, veterans and active duty military can get a free meal. Choose from the following entrées. Chipotle: Show military ID and enjoy a buy-one-get-one-free burrito, bowl, salad or taco for dine-in on Nov 11. (Limit one free menu item). Cracker Barrel: Veterans and active military will receive a complimentary crafted coffee or a slice of double chocolate fudge Coca-Cola cake at all locations on Nov. 11. Denny's: From 5 a.m. to noon on Nov. 12, veterans and active military personnel can get a free "Build Your Own Grand Slam," which includes a choice of four breakfast items, like: two buttermilk pancakes, two eggs or egg whites cooked to order, two bacon or turkey bacon strips, buttermilk biscuits or hash browns. Dine-in only, and show military ID of DD 214. Dunkin' Donuts: Veterans and active duty military can get a free donut of their choice with no purchase necessary on Nov. 11. (One per customer, while supplies last). Famous Dave's: All former and current military personnel can take advantage of their free two-meat salute, and choose from the following list on Nov. 11 and 12. Golden Corral: 5-9 p.m. on Nov. 12, all former and active military can get a free meal — dine-in only. 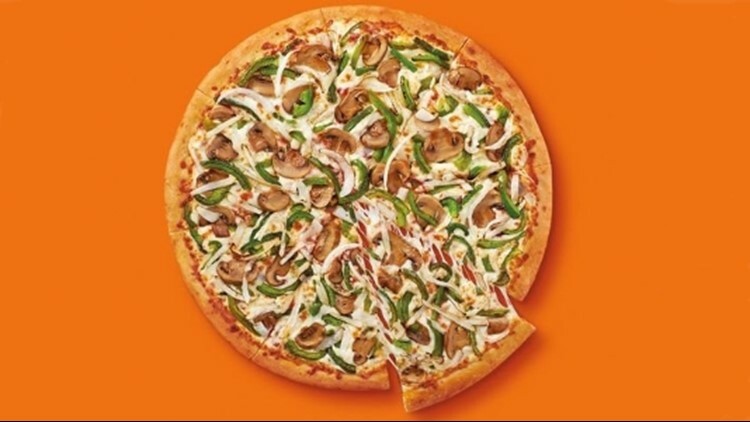 Little Caesars: From 11 a.m. to 2 p.m., veterans or active duty military can can a free $5 Hot-N-Ready Lunch Combo (four slices of deep dish pepperoni pizza and a 20-ounce Pepsi product) on Nov. 11. Proof of service is required. Logan's Roadhouse: From 3-6 p.m. on Nov. 11, veterans and active duty military can order a free American Roadhouse Meal from their special menu. Max & Erma's: Veterans and active military personnel can get a free half-pound hand-crushed cheeseburger, endless seasoned fires and a fountain drink on Nov. 11. McCormick & Schmick's: On Nov, 11, Veterans and Gold Star Honorees (parents and spouses) can choose a free lunch or dinner from their Veterans Day menu. Military ID and dine-in required. Menchie's: All veterans will get a free six-ounce frozen yogurt on Nov. 11. National Coney Island: Retired and active duty military can get free Coneys on Nov. 11, military ID or proof of services is required. Dine-in only at participating locations. Potbelly: On Nov, 12, show your military ID and grab a free cookie with any purchase. On the Border: Show military ID or proof of service and enjoy a free Create-Your-Own-Combo 2 Meal with rice and beans, plus endless chips and salsa on Nov. 11. Primanti Bros.: Veterans and active duty military with valid proof of service can get a free Classic Primanti Bros. Sandwich all day on Nov. 11. Red Robin: Veterans and active duty military can get a free Red's Tavern Double Burger and bottomless steak fries on Nov. 11. Ruby Tuesday: On Nov. 11, all veterans, active duty military and reserve service members with valid military ID can get a free appetizer. Starbucks: Veterans, active duty service members and military spouses can get a free tall hot-brewed coffee at participating locations. Texas de Brazil: A party can get two free veterans meals on Nov. 11 and Nov. 12, plus 20% off for up to six additional guests. Texas Roadhouse: Veterans and active duty military can get free lunch on Nov. 11. World of Beer: Veterans and active duty service members can get a free select draft beer or $5 off their check. White Castle: Veterans and active members with valid military ID who dine-in or drive thru can get a free Combo Meal at a participating White Castle on Nov. 11 and Nov. 12. Have a news tip? Email news@13oys.com, visit our Facebook page or Twitter.